So, you’re still searching, or just started looking for the perfect Mother’s Day gift. Don’t worry. Downtown Ithaca’s has got you covered. Our unique shopping boutiques, dining establishments, and service providers offer something your mother is sure to appreciate. Here are a few last-minute items to consider for your mother this year. Amuse sells an assortment of greeting cards ranging from funny to sentimental to religious and to secular. Amuse is located in Press Bay Alley and will be open Friday (today) and Saturday from 11am-6pm and on Sunday, Mother’s Day, from 11am-4pm. Mockingbird Paperie also offers a fantastic selection of Mother’s Day greeting cards and an incredible variety of specialty gifts. For decades, Bool’s has wowed mothers and mothers-to-be with their stunning freshly picked and prepared floral arrangements. This long-standing florist shop also sells greeting cards, chocolates, and local gifts too! Bools will be open Saturday from 9 a.m. to 5 p.m. and Sunday from 9 a.m. to 3 p.m.
Handwork is stocked on botanical textiles and wearable art from co-op artist Esther Yaloz of Planetarium Design. Esther’s silk scarves, tea towels, lunar calendars, purses and more are part of our Fiber Sale, 15% off this Thursday through Sunday. Many masterfully handcrafted items are also on sale as part of the shop’s Mother’s Day Weekend Sale. Ithacamade, located in the Dewitt Mall, carries a grand selection of locally made jewelry, pottery, women’s accessories, and more. At 15 STEPS, Shop handcrafted jewelry, scarves, handbags, pottery, leather journals, locally made, gift certificates, chocolates, new arrivals, and more! To shop 15 STEPS online, visit https://www.fifteensteps.com/shop. gallery favorite; Holly Yashi. Come to the shop to check out Yashi’s beautiful collection along with collections produced by other highly skilled artisans. Does your mom enjoy sipping on glasses of wine? Well, then, we have the perfect gift idea for her. Hotel Ithaca, Simeon’s American Bistro, Ithaca Marriott on The Commons and Coltivare are all offering special Mother’s Day brunch menus. Reservations are encouraged but not required. Call Coltivare for reservations at 607-882-2333 or book online at https://coltivareithaca.com/reservations/. For more info., click here. Simeons will be offering brunch & dinner specials, including a delicious rosé wine & peach sangria! Every Mom that visits Simeon’s during Mother’s Day Weekend will receive homemade macaroons & a $20 gift card that she may use on her next visit to Simeon’s! For pricing and menu, click here. Wine & Design is hosting a special Mother’s Day Open Studio on May 13 at 1 p.m. Grab your mom and come paint whichever flower arrangement you’d like! Please reserve and pay for your seat below. Let us know your choice in the comments section. Please arrive 15 minutes early to sign in and choose your seat. Please bring your own drinks and food. We will supply cups and a corkscrew. Email ithaca@wineanddesign.com with any questions or call 607-742-5496. Norabloom Botanicals offers a holistic, clean, non~toxic approach to beauty, health, and wellness. Their manicures, pedicures, facials, and other spa treatments are the perfect gift to help your mother relax and pamper herself. Learn more about Norabloom’s offerings at http://www.norabloom.com/welcome. For additional information about shopping, dining, and specialty services in downtown Ithaca, visit www.downtownithaca.com. Downtown Ithaca is thrilled to announce Ithaca’s Community Art Bike Racks, the latest addition to downtown’s infrastructure will be among the extraordinary displays appearing in this month’s Gallery Night. This walking tour of the latest art exhibits at downtown’s galleries, shops, boutiques, and hotels is set for 5 to 8 p.m. on Friday, May 4 at 19 locations. The Community Art Bike Racks exhibit, a series of photographs which will be on display at the Community School of Music and Arts, introduces the 12 new decorative stationary bikes racks designed by local creators — Stephanie Johnson, Taylor Brady, Linka Preus, Danielle Bates, Micah Schwartz, Robert Roemisch, Ivy Stevens-Gupta, Chris Willett, Jonathan Billing, Nellia Mattson and Daniel Sperling — and currently available for use throughout the downtown corridor. Durand Van Doren, a highly skilled artist-blacksmith for the past 40 years, fabricated the racks. This special project was curated in partnership between the Downtown Ithaca Alliance (DIA), Tompkins County Tourism Program, BikeWalkTompkins and the City of Ithaca with support from a private donor. The project is designed to enhance Ithaca’s downtown with functional, creative bike racks while increasing a sense of community and possibility. “We participated in this project as our effort to make Ithaca more accessible to cyclists — to encourage cycling as a viable mode of transportation. While more people are opting to travel around by bike, many areas were in need of additional bicycle parking. We’re delighted these new bike racks will be among the many highlights in this month’s Gallery Night,” says DIA Executive Director Gary Ferguson. As part of this special showing at CSMA, guests will have the opportunity to vote for their favorite rack. CSMA will then host a bike rack awards ceremony, reception, and walking tour during the next Gallery Night (June 8) and a bike tour on Saturday, June 9. Details about Gallery Night’s additional exhibits are available in the Gallery Night booklet, which you can find at participating Gallery Night locations. Gallery Night information is also available at www.gallerynightithaca.com. Gallery Night is presented and sponsored by Tompkins Trust Company, supported by the Community Arts Partnership and with90.1, and organized by the Downtown Ithaca Alliance. Celebrate Grilled Cheese Month, and National Grilled Cheese Day on April 12th, in Downtown Ithaca. From the classic grilled cheese on sourdough to one-of-a-kind creations, many Downtown Ithaca’s eateries have your favorite comfort food staple ready to enjoy. Ithaca Ale House, 111 N. Aurora St. They claim it’s “the best-grilled cheese you’ll ever have.” It’s made with three kinds of cheese — American, Provolone, and Cheddar and grilled to perfection on crispy rosemary focaccia bread. You can choose any side dish to go with it,, but they highly recommend enjoying it with their cup of tomato soup. Don’t let the restaurant name fool you. Though Waffle Frolic specializes in making fluffy waffles, they can sure whip up a tasty pressed cheese sandwich. They have a handful of variations. Each is made with Havarti on rustic fresh bread, and then it can come with your choice of roasted garlic and portabella, black forest ham and maple mustard, caramelized onion, apple butter, bacon, roasted turkey and red pepper, spinach, artichoke and kalamata olive spread, artichoke and red pepper and sliced tomato. You also have an option to substitute with Daiya cheese. This quaint cafe in the Historic Dewitt Mall puts a fun spin on this classic sandwich. It’s made with local chevre (goat cheese), artichoke hearts, roasted red peppers and fig rosemary balsamic vinaigrette on focaccia and toasted to perfection. College Town Bagel, 203 N. Aurora St.
At this favorite local hangout, you can customize your grilled cheese. The cheese selection includes fresh mozzarella, brief, goat, vegan soy, swiss, cheddar, muenster, American or provolone. Then, choose your bread or bagel (way too many yummy options to list) and your sandwich temperature (hot, cold, pressed or toasted) and your toppings (again, there are many to choose from). Luna checks off all the boxes with its BBQ King Grilled Cheese. This tasty melt includes the restaurant’s popular braised short rib topped with Memphis BBQ, classic slaw, smoked Gouda mac, NY Cheddar, fried onions, pressed bread. Oh, my and yum! Monks offers a perfect grilled created using black pepper cooper, a one-of-a-kind cheese with sharp flavor, on Buttered Sourdough. And, its served with served with potato chowder — a delicious combination! In addition, Ten Forward Cafe, The Commons Kitchen, Center Cafe (in Center Ithaca) and Kilpatrick’s Publick House are potential spots to find a version of this type of sandwich. Enjoy! Downtown Ithaca’s Commons, home to many excellent fine dining and fast food options, will soon have a family style restaurant added to its mix. Nadina Azzouay, a longtime home-cooker and the wife of Casablanca Pizzeria owner Adil Griguihi, is opening her own business, The Commons Kitchen at 124 East State St. (The Commons), the former Due Amici Ristorante site. “We are delighted to welcome Nadina Azzouay, The Commons Kitchen, and its specialty dishes to our thriving community. The family style and ethnic dining experience that The Commons Kitchen will provide is going to be a wonderful addition to our diverse restaurant scene. We wish Nadina and the business great success,” says Gary Ferguson, executive director for the Downtown Ithaca Alliance (DIA), a not-for-profit organization that represents and promotes downtown’s businesses. 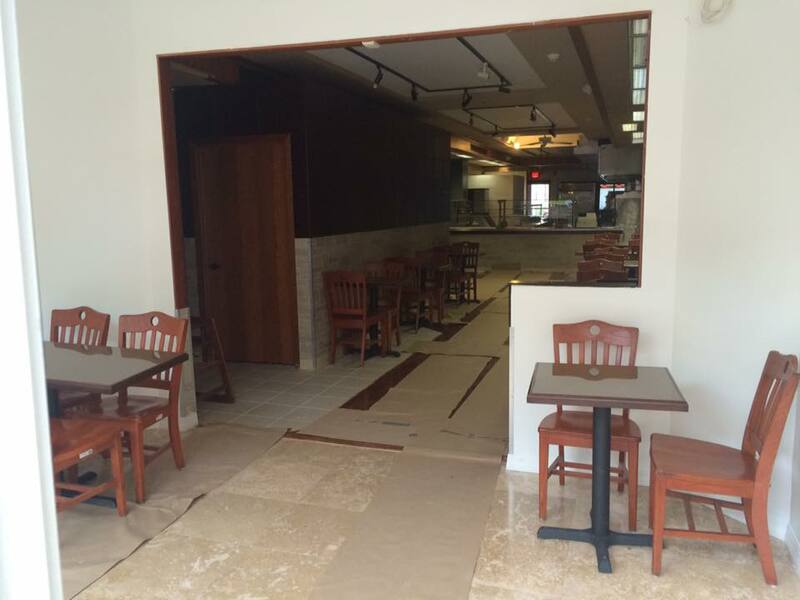 The new Mediterranean dining hotspot plans to open on Sunday, April 1. “With all of the development and growth that is now happening on The Commons, this is the perfect time to open this restaurant here…We’re going to do well because we’re going to serve delicious meals that are unlike any other that you’ll find downtown,” says Azzouay. At The Commons Kitchen, guests will have their choice of breakfast staples such as omelets and pancakes, daily homemade soup and sandwich lunch specials, Chicago style pizza, and a variety of dinner choices including vegan and gluten-free dishes. Freshly prepared baked goods including many types of bread, cupcakes, and muffins will also be available. “It seems many people are often too busy to cook healthy, home-cooked meals. When they eat here, they’ll receive a homemade meal that is prepared using fresh ingredients, no canned foods. The meals will be very healthy and complete meals offered very affordable prices,” says Azzouay. Customized meals will also be available upon request. “If someone has dietary restrictions or a specialty diet, we’ll create a meal that suits them. We want to make sure that everyone can enjoy eating a meal here,” says Azzouay. Commons Kitchen will be open from 7 a.m. to 10 p.m. daily. Dine-in, take-out, delivery, and catering services will be available. Also, Commons Kitchen will be available to rent for private parties. For additional details about The Commons Kitchen, call the restaurant at (607) 339-0790 or (607) 339-0622. The Commons Kitchen is one of many new businesses to join the downtown community in recent months. Odyssey Wellness and Sweet Melissa’s Ice Cream Shop also recently opened in the area. The DIA and City Mayor Svante Myrick will welcome them with a ribbon cutting ceremony at each of the businesses on March 29. The celebrations will start at 2 p.m. at Odyssey Wellness located in the Dewitt Mall followed by a ceremony at Sweet Melissa’s in Press Bay Alley. Sweet Melissa’s is also hosting its own special grand opening event on March 31. More details about that activity can be found on the DIA’s Facebook Events Page or on Sweet Melissa’s Facebook Page. For more information about any of these businesses, contact the DIA at (607) 277-8679 or email info@downtownithaca.com. ITHACA, FEBRUARY 16, 2018 — Downtown Ithaca is gearing up for its biggest night of the year — it’s Annual Dinner and Awards Ceremony. The Downtown Ithaca Alliance (DIA) will present the annual affair on Monday, March 5 from 6 to 8:30 p.m. at the Marriott Downtown on the Commons. Doors will open at 5:30 p.m., and a cash bar will be available prior to the dinner. During this time-honored celebration, the DIA will recognize the corporate, elected, entrepreneurial, and community leaders who were instrumental in the ongoing development of Downtown in 2017. Dozens of the city’s top leaders in business, philanthropy, and government will be in attendance. The focus of this year’s celebration is Why I Believe in Downtown. DIA Executive Director Gary Ferguson will present information regarding the current and future state of Downtown and Joe Wetmore, DIA founder and Autumn Leaves Used Booksowner, will discuss the beginnings of the DIA and its early vision. The not-for-profit organization is entering its 21st year in existence this year. In addition to these presentations, Rosie App CEO Nick Nickitas, Green Street Pharmacy Owner and Pharmacist Nicole Pagano and Urban Core LLC Co-Founder John Guttridge will provide short master talks. The night of celebration will conclude with the DIA presenting a total of seven awards including Economic Development Project of the Year, Retailer of the Year, Office Business of the Year, Nonprofit partner of the year, Downtown partner of the year, Board Member of the Year and Downtown Entrepreneur of the Year. “Downtown Ithaca has become a dynamic community center, thanks to the hard work and investment of many people. Our annual dinner is an opportunity to celebrate these achievements and pay tribute to some of our most outstanding examples of success in 2017,” Ferguson said. Prior to the awards ceremony, honorees and guests will be treated to a freshly prepared buffet style meal of field greens, panko crusted chicken, Mixed Vegetables and Tofu with Coconut Red Curry Thai Sauce, Cilantro Lime Sauce (gluten free & vegan), grilled vegetable ratatouille, a dessert and a complimentary glass of wine. Seating is extremely limited to this special engagement so promptly buy your tickets by calling the DIA at (607) 277-8679, or email info@downtownithaca.com. Ticket purchases may also be made online at https://squareup.com/market/downtown-ithaca-alliance. Five new retailers will join Downtown Ithaca’s vibrant business community very soon as a result of the Downtown Ithaca Alliance’s and Urban Core LLC’s Race for the Space II competition. DIA Executive Director Gary Ferguson and Urban Core LLC’s John Guttridge announced the highly competitive retail business contest’s five winners during a special press conference held Thursday at Ithaca’s City Hall. The five finalists business plans were selected from a field of 17 business proposals submitted this past Fall. Halal Meat and Groceries, a butcher shop and convenience store targeting international residents from Middle Eastern countries and the Gulf states, claimed the contest’s top prize. As the winner, Halal receives a one-year rental free space located in the Press Bay Court project, at 110 W. Green Street, which is currently being built by Urban Core LLC and adjacent to the successful Press Bay Alley retail complex, also owned and managed by Urban Core. Halal also garnered a $4,500 cash award to assist with the build out. The new Halal shop will feature an expansive selection of high quality local halal meats, international foods, spices, and more, according to the business plan created by store owner Abdul Jalil. Race for the Space winners Layne Dann (Gee June Bridal), Laila Begum (Halal Meat & Groceries), Kristen Dutcher (Hair Color Art), Amy Cohen and Kiera Carman (One Ring Donuts). Along with the one year of free rent and cash, Halal Meat and Groceries will also receive monthly technical assistance and support from a team of marketing, financial, and small business experts who have agreed to work with them to help bolster their opportunity for success. It is important to note Halal was also required to sign a multi-year lease — with the first year being the free year. Race for the Space II’s four runner-ups are Gee June Bridal Shop; One Ring Donuts, Rogue Donuts; and Hair• Color • Art. Each of these businesses received a cash prize to assist with their business built out and also signed a multi-year lease for space at downtown locations. Gee June Bridal Shop, One Ring Donuts, and Hair • Color • Art will also open in the new Press Bay Court project. Rogue Donuts is currently working on finalizing a lease at another location in downtown. For the Race for the Space II competition, each business submitted preliminary applications followed by a complete business proposal then, lastly, completed in-person presentations to the selection jury. “We believe these finalists will add to downtown’s vibrancy, diversity, and all-inclusive culture. Their business plans are very impressive and we look forward to working with each of them,” says DIA Executive Director Gary Ferguson. Each of the Race for the Space II winning businesses is expected to open later this year. Keep an eye out for business opening announcements from the DIA. For additional information about Race for the Space II, visit www.downtownithaca.com or call the DIA at (607) 277-8679. ABOUT HALAL MEAT AND GROCERIES: Halal Meat and Groceries, a butcher shop and convenience store targeting international residents from Middle Eastern countries and the Gulf states, will feature an selection of high quality local meats, international foods, spices, and more. Halal will be located on the 100 block of W. State Street in Downtown Ithaca. ABOUT GEE JUNE BRIDAL: Gee June Bridal is an experiential bridal boutique where its founder and owner Layne Dann handmakes custom designed, vintage, repurposed, and eco-friendly wedding inspired apparel and accessories for a bride and their wedding party. Dann currently works out of a Homer, NY location and also completes custom work at Fibers in the Dewitt Mall. The shop will have a brick and mortar location in Downtown Ithaca in the Spring of 2018. Additional information is available at http://www.geejunebridal.com. ABOUT ONE RING DONUTS: One Ring Donuts will serve many varieties of freshly baked donuts made with high quality ingredients. Many flavors and toppings will be available. One Ring Donuts will be owned and operated by Kiera Carman and Amy Cohen. ABOUT ROUGE DONUTS: Rouge Donuts is a retail shop and bakery that will serve freshly baked donuts, including gluten-free and vegan options, cakes, breakfast sandwiches and coffee-type beverages in a casual, cafe setting. Rouge Donuts will be locally owned and operated and is currently working on their location. ABOUT HAIR • COLOR • ART: Hair • Color • Art provides top-quality hair services for all ages in a creative, welcoming, community- supporting studio space. Our services include cuts, colors, intense colors, styles for special occasions and products for hair. Guest providers will offer additional services including makeup artistry and specialty styling (dread locks, specialty braiding, etc.). More information is available at http://www.haircolorart.com. ITHACA, NY JANUARY 24, 2018 — Downtown Ithaca’s 20th Annual Chili Cook-Off is coming to the area Saturday, Feb. 10 and will be bigger and better than ever with more than 40 participating restaurants sharing their extremely tasty concoctions and tons of other fun activities going on during the celebration. Tompkins Trust Company presents this highly anticipated community tradition, which is set from 11:30 a.m. to 4 p.m. on The Ithaca Commons, 171 E. State St. The Chili Cook-Off, which draws thousands of attendees each year, features hundreds of gallons of freshly made sweet, spicy, and/or tangy chili samples that are masterfully created by the some of the region’s best chefs. These culinary experts will be competing for coveted prizes (Best Meat, Best Vegetarian/Vegan, Best Other Chili Item, and People’s Choice Chili awards). Meat, vegetarian, vegan and gluten-free sample options at Chili Cook-off will be available. “People in this region simply love the varieties of chili and all the of the special activities included as part of this annual recognition of this spicy stew. This year, we’ve recruited a group of widely known restaurants that will showcase some of the very best and most creative chili and chili related recipes around. The public is truly going to enjoy what’s in store for them this year, and we thank Tompkins Trust Company for its continued support for this ultimate foodie and family-friendly event,” says Scott Rougeau, Special Events Associate for the Downtown Ithaca Alliance, the event’s organizer. During the event, Chili Cook-Off visitors can help to name the competition’s People’s Choice champion by sampling chili throughout the day and voting for their favorites. Winners of a jury contest and the People’s Choice honorees will be announced at a later day. The grand prize is the famed Chili trophy and plenty of bragging rights! Last year’s People’s Choice and Best Presentation winner Monks on the Commons is returning and will be serving a Texas-style chili that is sure to gain many votes. Guests will also enjoy chilis from some new participants including Cornell Catering which will feature meat, vegetarian and vegan chili options. are also ready to flex their chili making muscles. Collegetown Bagels Pub, Farm and Brewery and BandwagonLocal dining favorites and long-time chili participants Bandwagon will be serving a fired-up chili made with locally sourced meat and house-brewed beer, while Collegetown Bagel will offer both a meat chili made with grilled steak chili and a vegan tofu tomatillo chili. For the brew lovers, Grist Iron Brewing, Bacchus Brewing Co., and Wagner Valley Brewing are among the list of beverage establishments that will provide beer tastings throughout the event. 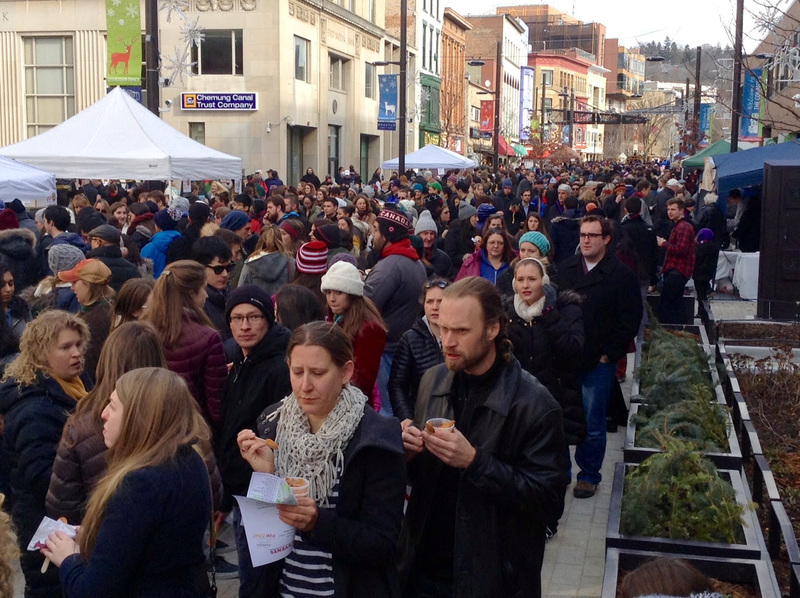 Thousands of people attend the Downtown Ithaca Great Chili Cook-Off each year. Chili Cook-Off will also host a variety of culinary purveyors offering chili-inspired bites, such as Life So Sweet Chocolate’ssweet and spicy raspberry jalapeno chocolate truffles, local microbrews and wine (Don’t forget your ID! ), and farm-fresh goods. In between chili chowing, fest-goers can take in the annual spectacular beard and mustache competition – an artistic demonstration showcasing the latest manscape trends, and the extremely popular Silent Disco — details about this wild, wireless dance party are available at www.downtownithaca.com. For those who are young and young at heart, free face painting, games, and additional fun-filled activities will be available in the Tompkins Trust Family Fun Zone happening inside Center Ithaca. Presale tickets for this fun-filled, family-friendly event will be available starting February 1 at the Downtown Visitors Center (171 E. State St.), and at two Collegetown Bagels locations (203 N. Aurora St., and 415 College Ave.). If you’re coming in from out of town, you can reserve tickets at will-call with your credit card by calling the Downtown Ithaca Alliance at (607) 277-8679. As always, you can purchase tickets on the day of the event at the event (cash only). Tickets are $5 for five tastes or $10 for 10 tastes of food, wine, and beer. VIP tickets are also available and give you access to a separate, fast-moving line for tastes, plus the annual fest badge of honor, the chili necklace (while supplies last) at 10 tastes for $20 and 20 tastes for $40! Parking will be available on the surrounding streets and in the city’s three parking garages — Seneca, Green and Cayuga Street. The parking garages will be charging a $5 special event fee. For additional event information about Chili Cook-Off activities, visit www.downtownithaca.com, our Facebook Events Page, or call us at (607) 277-8679.